Unsolved: The Murders of Tupac and Biggie has a pretty big job to do when it premieres tonight on USA. The miniseries chronicles the 2007 investigations into both murders by Detective Greg Kading (Josh Duhamel), as well as the original investigation into Biggie's 1997 murder, led by Detective Russell Poole (Jimmi Simpson). At the center of it all are the two victims and beloved rap stars, Tupac Shakur and Biggie Smalls. Tupac is played by Marcc Rose (who played the same role in Straight Outta Compton) while Biggie is played by Wavyy Jonez. Both actors talked to E! News about the pressure to get it right. "Tupac and Biggie mean a lot to the culture," Jonez told E! News' Sibley Scoles at the show's premiere. "I'm so with this project because it's going to bring closure to a lot of families, a lot of fans, and everybody that wondered what happened to Tupac and Biggie, and this series is definitely going to do it for them." Rose explained that the show gave him the opportunity to really "peel back the layers of who Tupac was." 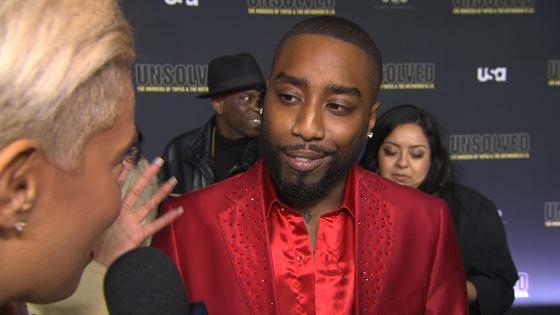 "With this, we get 10 episodes...and we really get to show who Tupac was and his relationship with his friends and his family, how his death affected his mom," he says. "You see a lot of stuff, as well as learn a lot of new details about the murders." Tupac's brother Mopreme Shakur was also on hand to weigh in on the series, as well as his relationship with Marcc, who refers to him as "Uncle Mo." "We knew—Pac knew—we knew we were on a legendary track. No one knew how it was going to end, and it hasn't ended, because the legacy lives on. Brothers like Marcc, Wavyy, learning the good, learning the bad, learning the mistakes, learning from the mistakes, and try to improve on all of us, on our communities, the hip hop community, the black community, poor and disenfranchised communities..." Shakur says. "That's sorta what our movement was about. That was one of the aspects. But my job is to be a brother to brothers, so I'm trying to help the brothers get on the right track, learn from Pac's story, our story, and have this production do it the best way possible." "I just want 'em to get it right as possible because Pac's my brother, my loved one, and if they're gonna tell it, you better tell it right," he added. Part of telling that story right comes with the casting, so to see the full cast alongside their real-life counterparts, click through our gallery above! Unsolved: The Murders of Tupac and the Notorious BIG premieres tonight at 10 p.m. on USA.